Hi, everyone. January is now over, and the only down side to this is that Long-Awaited Reads Month has come to an end. That went by fast, didn’t it? I’m going to do a wrap up post and announce the winner of my giveaway very soon, but I thought I’d give participants a few extra days to get their reviews in if they’re still planning to. Remember, though, that you can enter the giveaway even if you didn’t review your books — just leave me a comment telling me a little bit about what you read. So You Want to be a Wizard by Diane Duane – this one is a bit more recent than the rest of the titles on this pile, but still older than me and a beloved fantasy classic. The Midnight Kittens by Dodie Smith – Kittens! Also Dodie Smith. Jo of the Chalet School by Elinor Brent-Dyer – I’ve been meaning to try one of the Chalet School books for a while, so when I spotted this at my library I had to grab it. I have no idea if it’s actually a good one to start with, though – any thoughts? The Fairy Doll by Rumer Godden – because Jenny. The Young Unicorns by Madeline L’Engle – Recommended by Angie and by my boss, who kindly lent me her copy. 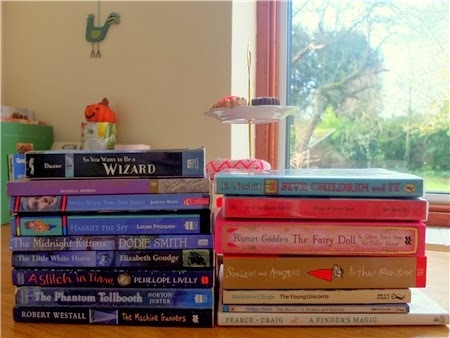 The Battle of Bubble and Squeak and A Finder’s Magic by Philippa Pearce – because I always need more Philippa Pearce in my life. And of course my current read also qualifies – I’ve just started L.M. Montgomery’s Emily’s Quest, the last in the Emily of New Moon trilogy. I started the series for Long-Awaited Reads month and I’m really looking forward to finishing and writing about it. Naturally I don’t expect to get through this whole stack in the shortest month of the year, but it’s good to have plenty of options, right? If any of you feel inclined to peer-pressure me into prioritising certain titles, now’s the perfect time! This is going to be such a wonderful reading month for you! I've been wanting to reread The Phantom Tollbooth for a while now. A couple of years ago I made the decision to reread A Wrinkle in Time. I was petrified I'd ruin my memories of that book, but it was such a great experience. I got to discover all of the reasons I loved it so much as a child. Maybe this year I'll do the same with The Phantom Tollbooth. I think that might be the only one on your list I have read so I look forward to hearing your thoughts on the ones you read. Enjoy!! I keep meaning to read the Phantom Tollbooth - the woman I used to work with told me it was one of the most magical books she's ever read. I just never got around to it - I think I'll have to soon. I feel immensely guilty for never reading any of the books in your list, and not having heard of many of them. However, I love Dodie Smith, so I might check out the one you mentioned. Oo, great list! (I'm not just saying that because The Fairy Doll is on it, although I do truly think you'll love The Fairy Doll.) I'll be interested to know what you think of The Phantom Tollbooth -- I love it, but I read it as a kid, and I just wonder if it's maybe one of those books you HAVE to read as a kid in order to love them. Just looking at those lovely piles makes me want to have this as a theme month even more! Chris mentioned April or May. And I'm thinking April would be awesome because of Dewey's Read-a-Thon--wouldn't books like these be just *perfect* for read-a-thon?!! Of course, I've never even heard of many of your titles there--which means, yep, there grows the wish list. :P But then that will just give me more options for April, right? The only one I've read is The Phantom Tollbooth. I read it as an adult, and found it pretty delightful, but I have a feeling it's one of those books that I would have loved even more as a kid. Harriet the Spy was one of my childhood favorites. There was actually a time when I was reading it monthly! I was sorry when none of my daughters loved it as much as I did. It looks like even if you aren't reading graphic novels you have a great month planned. :) I enjoy all of L'Engle's books. I was younger when I read The Young Unicorn, so would be curious to see what you think when you get to it. So You Want to be a Wizard was one of my absolute favorites as a child, and has remained hugely formative today - what reader doesn't resonate with the idea that words have meaning, and almost magical power? I haven't read most of the others and may have to add them to my list. I've been checking out a lot of children's and YA lit out from the public library lately; it's extremely comforting in the midst of graduate school! I hope you enjoy all of these and that they help keep February cheerful for you. What a yummy list! Harriet the Spy, The Phantom Tollbooth, Five Children and It and The Little White Horse are some of my very most favorite books from childhood. The Mouse and His Child is beautifully written but somehow did not resonate with me in the same way. I should revisit it and see how it reads now. Loved your list, Ana! I thought I was the only guy who had Diane Duane's 'So You Want to be a Wizard' and was thinking of reading it :) Nice to know that you are planning to read it too. One of my friends once told me that 'The Phantom Tollbooth' is one of her top-5 books of alltime. I have been trying since then to get it. Hope you enjoy reading it. I will look forward to hearing your thoughts on it. I want to read Edith Nesbit's 'Five Children and It' too. I think this story is a pioneering work because other recent fantasy writers have borrowed the same idea from her. It's ages since I've seen a list that just looks totally fun like this one! I was a huge Chalet School fan in my youth (still am, I confess, but they are packed away now), and Jo of the CS is an early one, and the early ones are generally pretty good. Enjoy! Oh, THE PHANTOM TOLLBOOTH, my favorite, favorite, favorite of all time. Good plan! Midnight Kittens sounds adorable. Such a good idea, to be reading all children's books all month. I haven't read any one of those but they all sound delicious. I do have a couple of E. Nesbits on the shelves, still untouched. I'd love to hear your thoughts on When Hitler Stole Pink Rabbit by Judith Kerr! Have a great month, you've got some good looking books to read. Such a delicious stack: I love it. Bubble and Squeak is charming and timeless: I think you will be enchanted. That's a wonderful looking pile of books! Can I ask whether your interests run towards Anglo/American children's lit or is that because of your work? I rarely see children's lit from other countries in the blogosphere. Perhaps that's another pile for another depressing February :) I loved The Phantom Tollbooth, so I'm voting that one. I just read So You Want to Be a Wizard for the first time last month. It was really good and surprisingly touching! good luck!